All Out Effort Blog: Are All Weight Loss Methods Created Equal? Are All Weight Loss Methods Created Equal? I know a lot of people get impressed by documentaries about people who've lost a massive amount of weight through juicing, cleansing, raw foods, or just plain starvation. When we all look at these bodies, they obviously look much smaller. Which is great and I am sure it is much more beneficial than where they were, and to some it saved their lives. But what I and other fitness nerds wonder (especially those who try to "hack" their bodies to be fully optimized) is, is this the most optimal body you could have? Is this the most optimal method? With weight loss, often times there is a lack of musculature and still a presence of high body fat. If you never saw the before picture, you would still think the person had a lot of body fat issues. All weight loss is not the same. 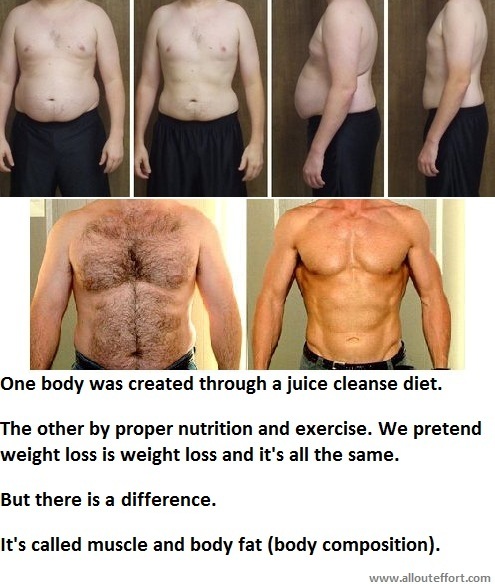 A guy who didn't starve himself and ate a good amount of protein, carbs, and fats and exercised frequently looks much different than the guy who only juice cleansed. What's really important? A body that is just smaller? Or creating a body that can be as athletic as possible? A body that can run fast, for a long time, jump high, twist, squat, pull, lift, plank, throw, etc? All weight loss methods were not created equally just as all calories were not created equally.